The Title "The Life and Opinions of Maf the Dog, and of His Friend Marilyn Monroe " is written by Andrew O'Hagan. This book was published in the year 2011. The ISBN number 054752028X|9780547520285 is assigned to the Paperback version of this title. This book has total of pp. 288 (Pages). The publisher of this title is Houghton Mifflin Company. We have about 46999 other great books from this publisher. 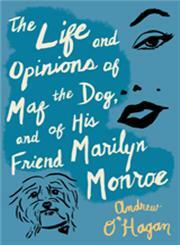 The Life and Opinions of Maf the Dog, and of His Friend Marilyn Monroe is currently Available with us.